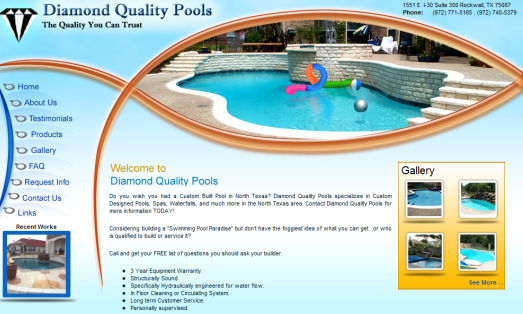 Diamond Quality Pools specializes in providing outstanding products and construction expertise to our customers. All of our equipment is top-of-the-line, and our experienced technicians carefully install each pool to ensure excellent performance. Diamond Quality Pools also offer many amazing options that will personalize your pool. Choose from therapeutic spas, rock waterfalls, fountains, spa spillovers, and more! 1. Products: Users can quickly and easily view products. 2. Gallery: Users can view photos of completed work. 3. FAQs: This page displays the top 6 things to consider when buying a pool.